I expected a lot. Short before the Google I/O I thought I will get disappointed. How could they fulfill so many things I wanted to see from Google. You know, they did. And more, they blew my socks off. 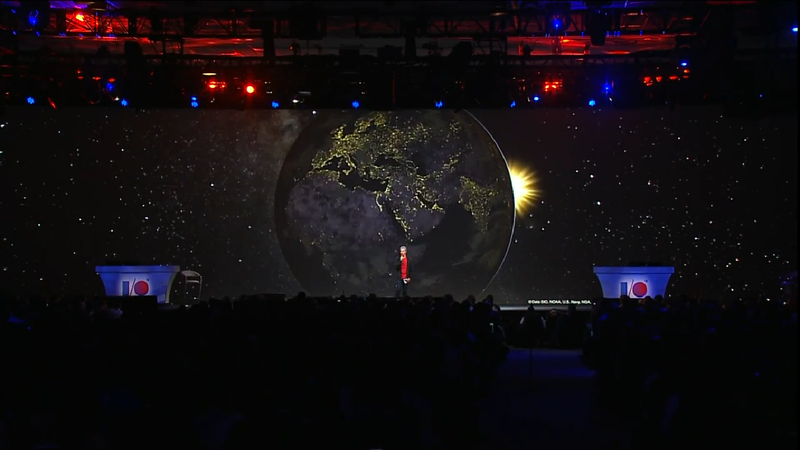 Larry Page with an impressive speech. Goose bumps. First they talked specifically for developers. A lot of Amazing stuff will come up for programmers to write new apps. Not only for Android, but for Chrome, too. 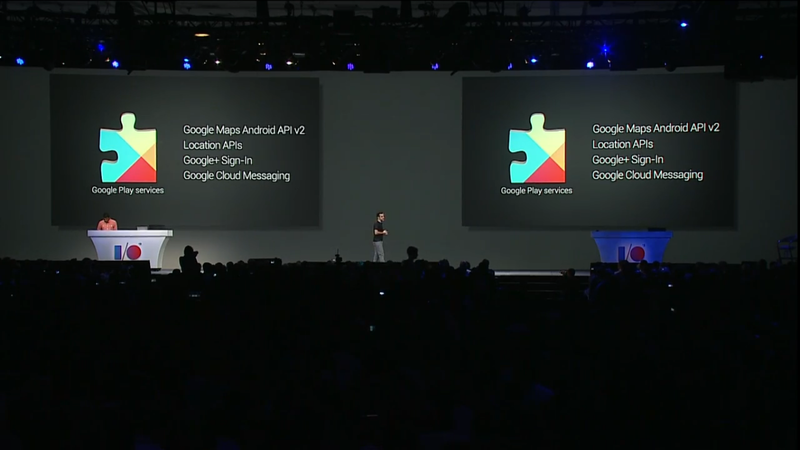 New "Play Services" and Google+ cross platform sign-in. And Google Game Services including "cloud save". Finally app developers can easily make sure people can play on any device where they left off on another device. The big thing for developers was "Android Studio". They audience enthusiastically applauded and screamed as the IDE is now from a well known tool. Amazing and powerful new tools that makes developing apps much easier. While the keynote running, I've got the new updated Play Store app on my Android devices. And it's again improved. The big change is for the Web version of the play store. It looks much like the play store on tablets design-wise. Then there it was, the first major drop on users. Google gets music streaming. "All Access" gives you access to millions of tracks with a unique feature. Radio makes an instant radio from the song you listening and your behaviors. You can then fully customize the playlist of that "radio" and even change the order of the tracks. They call this "Radio without rules". Galaxy S4 with Stock Android! Huga Barra drew it out from his pocket. Available in July in the US. Finally real Android on a real Samsung. Then another hammer falls: All new Google+! Completely new design with many new features. Most impressive the automatic hashtags that even works with photos by picture analyzing. You heard right. Eiffel tower in your photo? Get's hashtagged with #eiffeltower without writing a single word. Already rolled out. Now I choked: Google+ Photos. This will get another post. Amazing amount of new features. Auto Enhance in a new dimension for all of your photos with detail recognition. 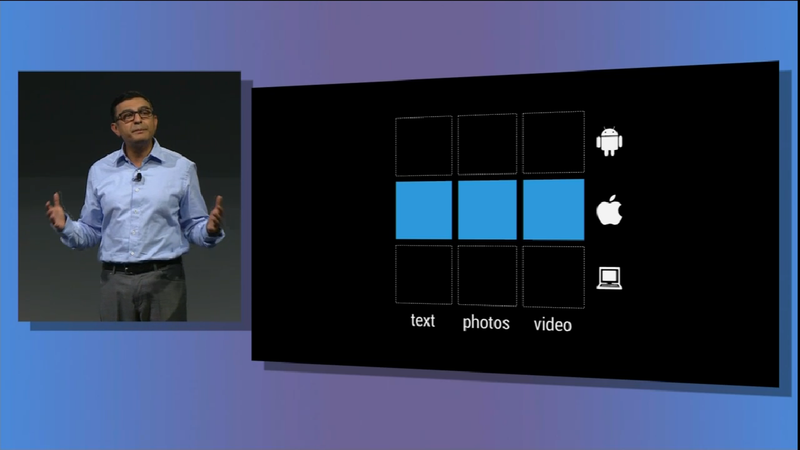 Sorting, Highlights, and then "Auto Awesome" even animates your pictures if you have multiple shots. Already rolled out. New Hangouts. A.k.a. Google Babel. The WhatsApp-Killer is here. Text, photos and videos cross-platform Desktop, iOS and Android. This is what I have been waiting for. Available today, but I discovered some hiccups on my P1000 tablet and the updating process seems to have problems at the moment. The new hangouts is also part of Google+. There was a lot more in the keynote alone. Google also participates more in education, with a special Play Store for education purposes. Teachers can buy and install apps and books to all of their students at once. New Google Maps upcoming. Google Search improvements. I could go on and on. They Google I/O was better than I've dreamed of. The new features were almost all available instantly. No Skydiver this year, but Google almost changed completely. All major services have been updated. Some even changed directions. Google rebooted on that day. It was a mind-blowing keynote for everyone who likes tech and see the future of the internet. For the last part, I have to add something myself. Larry Page gave an impressive speech on how tech evolved and where it's going. We apparently moving quicker than ever, but only a tiny amount of that what is possible, can already be used. And this is because tech companies fighting each other and slowing innovation and realization of things that already could exists. Goose-bumps. In his elvish voice (because of a problem he has), he made things clear that mankind have an exciting future ahead. We need to move faster in tech to solve the problems to further improve our lives. We have come a long way, a much longer way lies ahead of humanity. Google Introduces New Features for Android Apps and Games!! !